The tight demography in Asia has been well-documented. In fact, though emerging markets in Asia are the answer for many multinational companies seeking to enter or expand in a region, one of the most significant challenges managers face is the insufficient talent pipeline. Without the right people and skills, growth and long-term relevance are affected. - An aging population where the most experienced professionals are poised to retire, threatening the sustainability of the business. Some of the most critical shortages in Asia are in Japan, which, with its conservative culture and language barrier, can be a difficult “sell” to draw foreign talent, and just as difficult to retain them; Singapore, where there is a tight labor market and a deep scarcity of suitable candidates with the required appropriate technical skills for open positions; China, whose one-child policy from the late 1970s until 2015 contributed to the decline of its working-age population; and Vietnam, India, and the Philippines, which lack skilled local leadership; have complicated immigration application procedures and a regulatory process that hinders the hiring of foreign talent. Though India’s working-age population will see strong growth over the next decade, only a small percentage of its young population is skilled – compared to skill levels of 96% in South Korea and 80% in Japan, the lack of skilled labor can greatly impact India’s development potential. Professions in Asia with some of the most extreme shortages are engineering (in particular, software engineers and developers); technicians; sales representatives; IT (cyber security specialists and data analysts); hospitality (e.g., support staff positions that range from maintenance workers like housekeepers, electricians and plumbers to chefs, guest service representatives and service staff), and skilled trade workers. Workforce Solutions: Tried and True… and New! There are a number of solutions (that are quickly becoming standards) that help employers in Asia fill open positions. Some companies are implementing in-house rotational training programs that involve assigning and relocating experienced leaders to a specific country for on-the-ground training for locals. Some are improvising their staff retention strategy to retain skilled and experienced employees, or revamping specific job roles to attract and hire new talent. Still others are addressing skills gaps by increasing the focus on the talent pipeline and sourcing talent outside of established talent pools – so, for example, companies might recruit from unrelated industries, and work with an entirely different outsourcing company’s resources. Another option to attract talent is to redesign work practices to make the workplace more appealing, such as introducing flexible work hours. Several companies will bring in expatriates on fixed-term contracts to fill roles in Asia where they are experiencing a shortage. And like many companies across the globe, employers are ramping up the training and development of existing staff to meet future needs. There is a caution here for companies that are developing talent: the more effective an employee is within the company and the more training they receive, the more attractive they are to other employers – so as employees gain skills, it is equally important to have a strong retention program in place so they are not lost to a competitor after a substantial investment has been made. Because Asia’s demographics are so problematic, the situation is prompting some creative solutions to the talent shortage. Take Japan, for instance, which is leading the global population in aging: projections for Japan’s current 126 million population are that between now and the early 2060s it will shrink 31 percent - and working-age ranks will drop even further, by 42 percent. To shore up its sagging worker population, the Japanese government has decided to raise the official age of retirement to age 65 by 2025, as compared to 61 in April 2013, and 62 in 2016. Singapore, too, is taking advantage of its “silver tsunami” – so named because by 2030, one in five people in the city-state will be over 60, and the government there is encouraging its elderly to continue working beyond the official retirement age of 62 under its “policy of re-employment,” which gives employers the flexibility to decide which older employees they wish to retain, and under what terms. Singapore has also reduced its intake of foreign workers so that more locals can get jobs. Supporting women in the workforce is also a way to solve some of the talent shortages in Asia. Women in China now comprise half of the educated workforce, but have a lesser role in management. In Japan, the female participation rate in the workforce is at 66%, among the highest in the world, however, most of those are also not in management. Nearly 10 years ago, the government issued an intent to have women occupy 30% of leadership positions by 2020, but the goal isn’t close to being realized. In India, the female labor participation rate is only 25%. As businesses become more global; as more companies are headquartered in emerging markets; professional women are managing across multiple global boundaries. Companies can take a more holistic approach toward grooming female leaders, moving them into management positions, helping them build the credibility needed across global markets and teaching them how to build advocacy among other leaders. Using freelancers and other independent workers offers another solution. Technology enables global talent sourcing, and for companies that can add to teams with remote and/or on-demand workers, they can facilitate remote team operations. Freelance job site Upwork reports that there are 4.9 million freelancers from Asia taking advantage of the flexibility offered by remote work. With a laptop and mobile phone, these individuals can work anywhere, and provided they have the right skill sets and the work lends itself to fulfillment at a distance, can augment a global team’s productivity, and enable a company to staff up or down as needed. Partnering with universities has great potential for employers who are looking to build their future workforce. Helping schools build curricula that is relevant to the job market and to their business needs is a possibility. By participating with academia in a way that gives a company opportunities to offer internships and create awareness among students of the company’s employment options, they can position to connect with graduates more readily upon completion of their studies. In addition to some of these creative solutions, to build the right workforce in Asia, companies need to consider a number of other factors. For example, with the extreme diversity present in Asia’s workforce today, stronger cultural knowledge and training should be heavily implemented and emphasized within the company. And when a company is recruiting for less attractive locations, employers who understand what benefits and perks will appeal to the professionals they want to hire can build a more tempting package, so that the talent they seek will be more willing to relocate for their open positions. Employers must also ensure that they know what drives employees in different markets and regions in Asia. Is it career development and advancement? Salary? Flexibility? Travel? This is where workforce analytics can help track such data as preferences, performance, professional development, types of benefits and compensation, and inform the employer how to better manage their talent decisions and strategy. Still, despite the best efforts of companies in the region, the workforce picture in Asia could become even more challenging. Experts cite tighter and continually changing immigration rules and regulations in each country; and the fact that some countries have a more complex immigration application process than others. For example, the Singapore government has implemented several measures to encourage employers to consider more local applicants, prompting a higher minimum salary for work pass holders and a more stringent review of the qualifications submitted by potential applicants. In Singapore’s case, though, they are recognizing that these measures have created a shortage of manpower, so the government has allowed companies that fulfill the following requirements to be exempt from the requirement: the company has 25 or fewer employees, the salary for the job has a fixed monthly amount of S$12,000 and above, the job will be filled by an intra-corporate transferee (i.e., employees that hold a senior position in the organization or have an advanced level of expertise), and the commitment is for a short-term contingency. It is possible that as countries in Asia see that stronger protectionism is harming their economic prospects, they, too, will relax some of the stringent requirements they have incorporated. 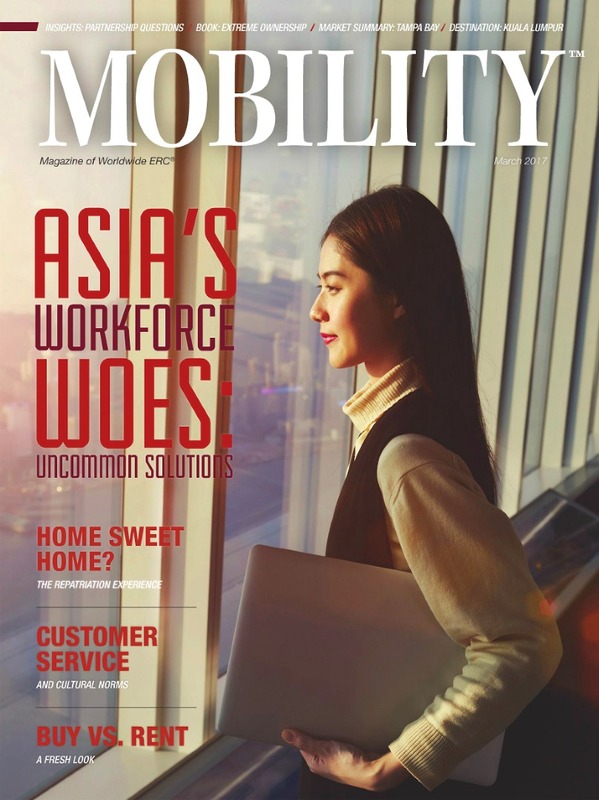 Competition for skilled workers in Asia is fierce, and growing stronger – making it even more imperative for employers to know their employees and potential workers: their motivations, aspirations and career initiatives - better than their competitors, to attract and retain the best talent. And maybe then the headlines will tell a different story. Hazel Ong is Consultant, Global Relocation Services, APAC for Cornerstone Relocation Group. She can be reached at +65.6408.0689 or by email at hong@crgglobal.com.